Look whose on the court and happy! We’ve continued playing weekly. If P would have given me a different reason for why she didn’t want to play I would have respected it. However, “it’s too hard” is not a good reason in my book. Once upon a time I felt P had strong perseverance. She use to work at things until she got super frustrated or got them. Now, I see she tends to give up easily. With much patience and love I’d like to help her persevere through things again. Tennis is just the activity to make this lesson poignant. Every week she does a little more. Every week she gets a little more excited. I’ve changed the lessons up a bit. I’ve added more agility and footwork drills. She can do those easier and all the girls need some work on these areas. Changing things up for P has made me look at the lesson overall. I’m trying to bring more enthusiasm to each girl. I notice that just throwing the balls to them for forehands and backhands doesn’t do too much although it does focus on technique. However, when I have them hit against a backboard or when I hit it back and forth with them as much as they can, they love it. It’s as if they need something more challenging. 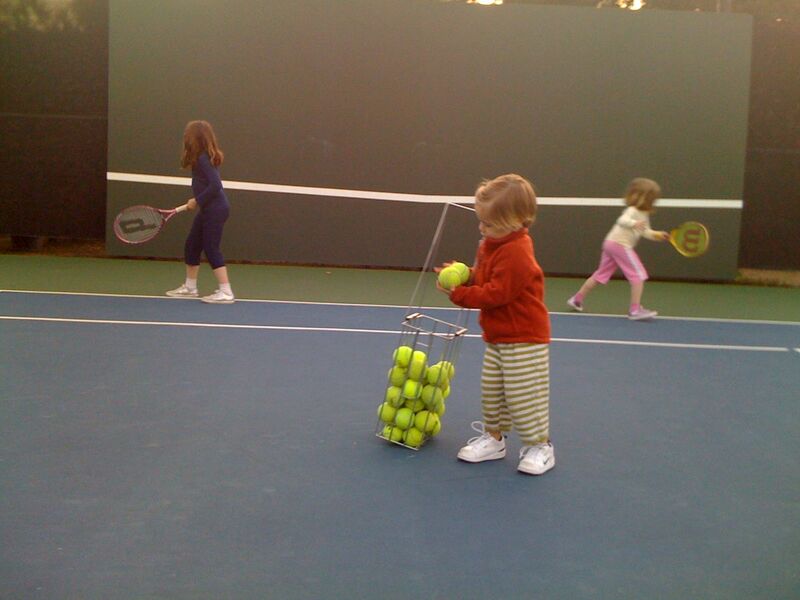 Or it feels more like a real game of tennis instead of just being fed balls. At any rate, I’m happy because P is still hanging in there and she asks for her tennis lesson every week. I also love to see all the girls make progress. Even if none of them ever do anything with tennis I feel each of them gains something personal from the whole experience.